Linden Homes consulted with councillors, stakeholders and members of the local community about the draft masterplan for the site ahead of submitting their planning application. The term ‘land north of The Brook’ refers to the land stretching from behind St Andrew’s Close across the back of The Orchards and Tower Road to the top of Mepal Road and the A142. What does the current local plan say? East Cambridgeshire District Council’s current local plan identifies part of this land for development of around 50 houses. It says that any planning application for housing on this site must show how it would fit in with any future plans for the rest of the site. What will the next local plan say? The District Council is revising its local plan. As part of this process it invited landowners and others to suggest land suitable for more development. Linden Homes, representing the owners of land north of The Brook, suggested to the District Council that the whole site be developed, with around 250 homes built there. The District Council’s call for sites report (link here) provides details of all sites submitted by landowners. The District Council decided to include this suggestion in next local plan and submitted the plan to the Secretary of State for examination in February 2018. More information about the district council’s local plan process can be found on the Local Plan Review page. What is the view of the Parish Council? 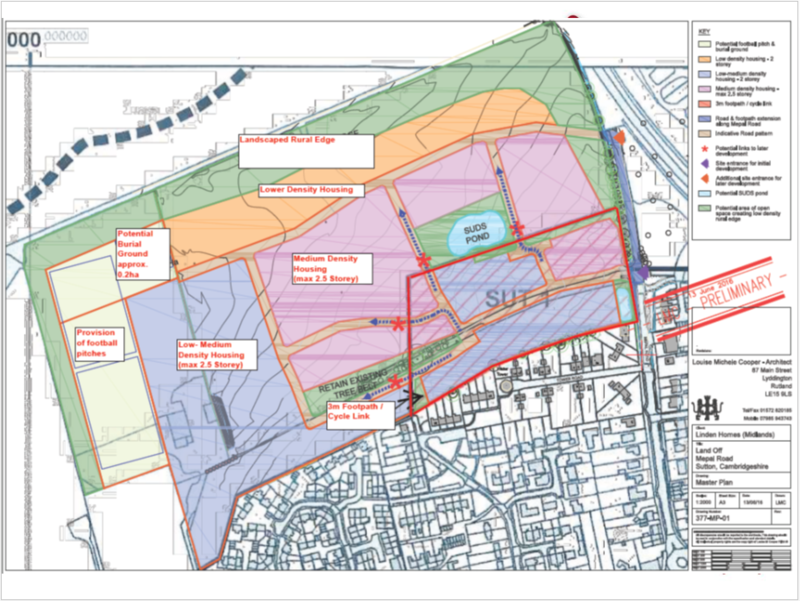 The Parish Council has considered the various sites submitted to the District Council by landowners and others for consideration for development. It has agreed that, of all the sites submitted in Sutton, land north of The Brook remains its preferred option. The Neighbourhood Plan Working Party, established by the Parish Council, has also prioritised this site. The Parish Council engaged with Linden Homes over the benefits to the community that could arise from development of this site. These include sports pitches and burial space, both needed in the village and supported by residents in the consultation over the Neighbourhood Plan. The Parish Council and the District Council both receive money through the Community Infrastructure Levy from developments in the parish. The Community Infrastructure Levy is a planning charge to help councils deliver infrastructure to support the development of their area. Linden Homes submitted a planning application for the corner of the site identified in the current local plan, but for 77 houses rather than 50. Details of the planning application can be found here. This application was considered by the district council’s planning committee on 13 July 2017 and refused on grounds of over-development together with concerns about drainage and traffic. Linden Homes have now lodged an appeal against the refusal of the planning application.